In 3-quart saucepan, place potatoes. Add water just to cover. Heat to boiling; reduce heat to low. Cover and boil gently (simmer) 5 to 8 minutes or just until potatoes are fork-tender. Drain; rinse with cold water until cool. In large bowl, mix potatoes and remaining salad ingredients. In small bowl, mix dressing ingredients. Pour dressing over salad; mix gently. Refrigerate 1 hour. 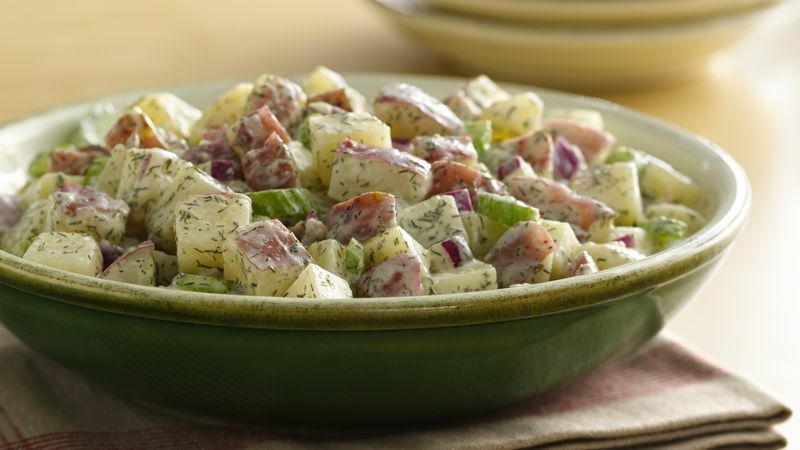 Prepare this potato salad a day ahead; cover and refrigerate. Just before serving, moisten with 1 to 2 tablespoons milk, if necessary. You can use Yukon Gold potatoes instead of the red potatoes.